NIS Director Kim visited North Korea as a special presidential envoy. The North proposed holding a summit in Pyongyang in late August. 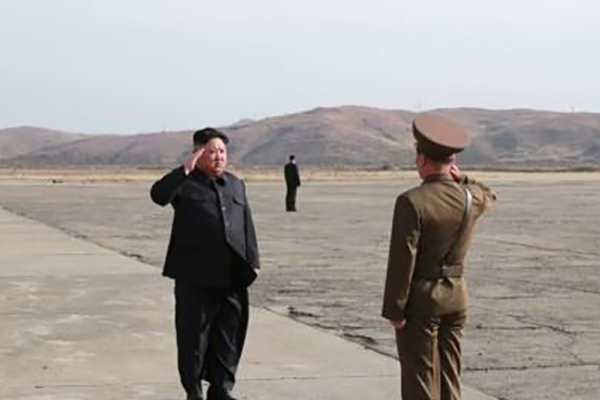 The NIS chief visited North Korea again. The two sides agreed to hold the summit. Seoul announced that the inter-Korean summit would be held August 28 ~ 30. The two Koreas agreed in working-level talks that President Roh Moo-hyun would travel to the North via an overland route using the road running alongside the Gyeongui Line cross-border railway. Seoul announced that the summit would be postponed to October second due to severe flood damage in the North. Seoul’s first advance party visited North Korea for preparations. Seoul’s second advance party visited the North. 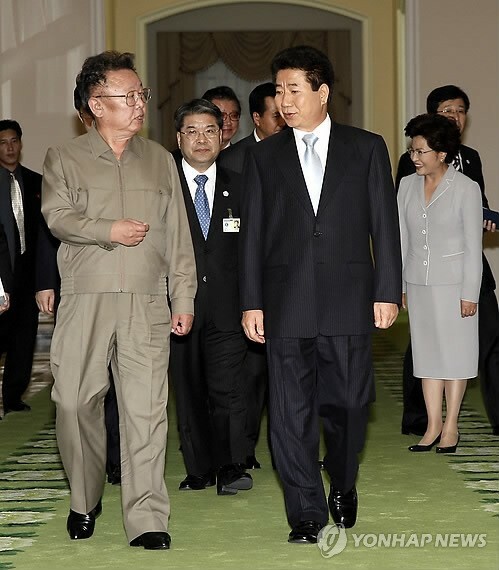 October 2 ~ 4 The 2007 inter-Korean summit talks took place in Pyongyang. President Roh Moo-hyun addressed the nation before leaving the presidential office, Cheong Wa Dae. Pres. Roh left Cheong Wa Dae by motorcade. Roh arrived in front of the People’s Palace of Culture. North Korea’s number-two leader and parliamentary chief Kim Yong-nam received him. North Korean leader Kim Jong-il received President Roh at the April 25 House of Culture with a welcoming ceremony including an honor guard inspection. Roh arrived at the Baekhwawon State Guesthouse. President Roh Moo-hyun met with parliamentary chief Kim Yong-nam at the Mansudae Assembly Hall, the seat of the North's parliament. 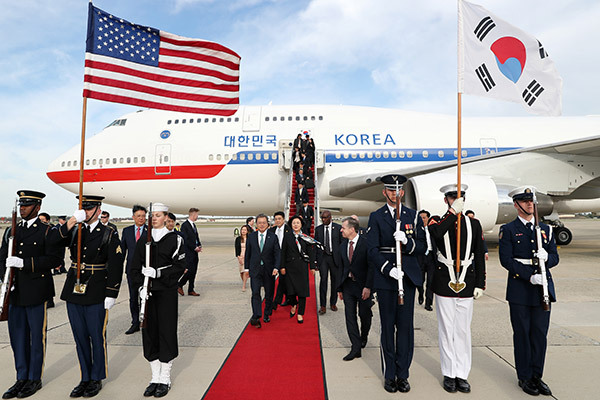 Kim Yong-nam hosted a welcoming banquet for President Roh. 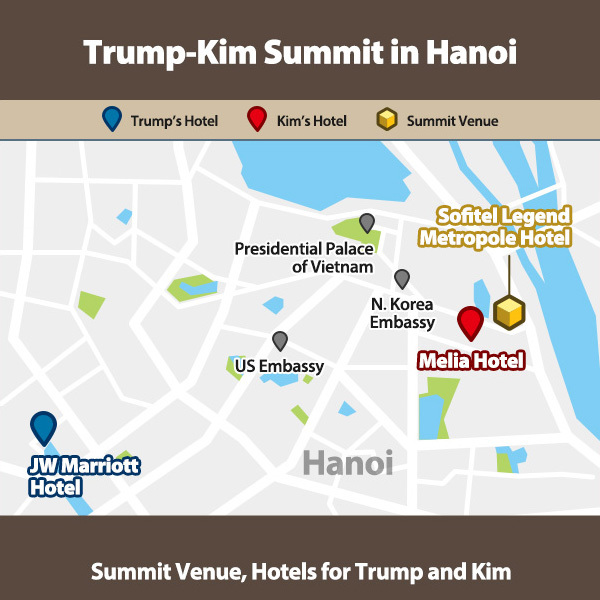 1st Round of Inter-Korean summit talks. 2nd Round (Kim Jong-il proposed to extend the summit talks by a day but later withdrew the invitation.). Pres. Roh watched the Arirang Festival (May 1st Stadium in Neungrado). President Roh Moo-hyun visited Pyeonghwa Motors in Nampo. The president visited the West Sea floodgates, also in Nampo. The two leaders signed the inter-Korean joint declaration and attended the farewell luncheon at Baekhwawon. Pres. Roh visited the inter-Korean industrial complex in Gaesong. The South Korean delegation arrived at the South's Dorasan Train Station. At the welcoming ceremony, Mr. Roh called his visit a success. The 2007 inter-Korean joint declaration signed by President Roh Moo-hyun and North Korean leader Kim Jong-il outlined the results of the two leaders’ summit talks. The October Fourth Joint Declaration comprises eight main paragraphs and two separate paragraphs. ㆍThey agreed to hold summit talks more frequently to promote inter-Korean relations. Declaration on the Advancement of South-North Korean Relations, Peace and Prosperity. In accordance with the agreement between President Roh Moo-hyun of the Republic of Korea and Chairman Kim Jong-il of the National Defense Commission of the Democratic People’s Republic of Korea, President Roh visited Pyongyang from October 2-4, 2007. During the visit, there were historic meetings and discussions. At the meetings and talks, the two sides have reaffirmed the spirit of the June 15 Joint Declaration and had frank discussions on various issues related to realizing the advancement of South-North relations, peace on the Korean Peninsula, common prosperity of the Korean people and unification of Korea. 1. The South and the North shall uphold and endeavor actively to realize the June 15 Declaration. The South and the North have agreed to resolve the issue of unification on their own initiative and according to the spirit of “by-the-Korean-people-themselves.” The South and the North will work out ways to commemorate the June 15 anniversary of the announcement of the South-North Joint Declaration to reflect the common will to faithfully carry it out. 2. The South and the North have agreed to firmly transform inter-Korean relations into ties of mutual respect and trust, transcending the differences in ideology and systems. The South and the North have agreed not to interfere in the internal affairs of the other and agreed to resolve inter-Korean issues in the spirit of reconciliation, cooperation and reunification. The South and the North have agreed to overhaul their respective legislative and institutional apparatuses in a bid to develop inter-Korean relations in a reunification-oriented direction. The South and the North have agreed to proactively pursue dialogue and contacts in various areas, including the legislatures of the two Koreas, in order to resolve matters concerning the expansion and advancement of inter-Korean relations in a way that meets the aspirations of the entire Korean people. 3. The South and the North have agreed to closely work together to put an end to military hostilities, mitigate tensions and guarantee peace on the Korean Peninsula. The South and the North have agreed not to antagonize each other, reduce military tension, and resolve issues in dispute through dialogue and negotiation. The South and the North have agreed to oppose war on the Korean Peninsula and to adhere strictly to their obligation to nonaggression. The South and the North have agreed to designate a joint fishing area in the West Sea to avoid accidental clashes. The South’s Minister of Defense and the North’s Minister of the People’s Armed Forces have also agreed to hold talks in Pyongyang this November to discuss military confidence-building measures, including military guarantees covering the plans and various cooperative projects for making this joint fishing area into a peace area. 4. The South and the North both recognize the need to end the current armistice regime and build a permanent peace regime. The South and the North have also agreed to work together to advance the matter of having the leaders of the three or four parties directly concerned to convene on the Peninsula and declare an end to the war. With regard to the nuclear issue on the Korean Peninsula, the South and the North have agreed to work together to implement smoothly the September 19, 2005 Joint Statement and the February 13, 2007 Agreement achieved at the Six-Party Talks. 5. The South and the North have agreed to facilitate, expand, and further develop inter-Korean economic cooperation projects on a continual basis for balanced economic development and co-prosperity on the Korean Peninsula in accordance with the principles of common interests, co-prosperity and mutual aid. The South and the North reached an agreement on promoting economic cooperation, including investments, pushing forward with the building of infrastructure and the development of natural resources. Given the special nature of inter-Korean cooperative projects, the South and the North have agreed to grant preferential conditions and benefits to those projects. The South and the North have agreed to create a “special peace and cooperation zone in the West Sea” encompassing Haeju and vicinity in a bid to proactively push ahead with the creation of a joint fishing zone and maritime peace zone, establishment of a special economic zone, utilization of Haeju harbor, passage of civilian vessels via direct routes in Haeju and the joint use of the Han River estuary. The South and the North have agreed to complete the first-phase construction of the Gaeseong Industrial Complex at an early date and embark on the second-stage development project. The South and the North have agreed to open freight rail services between Munsan and Bongdong and promptly complete various institutional measures, including those related to passage, communication, and customs clearance procedures. The South and the North have agreed to discuss repairs of the Gaeseong-Sinuiju railroad and the Gaeseong-Pyongyang expressway for their joint use. The South and the North have agreed to establish cooperative complexes for shipbuilding in Anbyeon and Nampo, while continuing cooperative projects in various areas such as agriculture, health and medical services and environmental protection. The South and the North have agreed to upgrade the status of the existing Inter-Korean Economic Cooperation Promotion Committee to a Joint Committee for Inter-Korean Economic Cooperation to be headed by deputy prime minister-level officials. 6. The South and the North have agreed to boost exchanges and cooperation in the social areas covering history, language, education, science and technology, culture and arts, and sports to highlight the long history and excellent culture of the Korean people. The South and the North have agreed to carry out tours to Mt. Baekdu and open nonstop flight services between Seoul and Mt. Baekdu for this purpose. The South and the North have agreed to send a joint cheering squad from both sides to the 2008 Beijing Olympic Games. The squad will use the Gyeongui Railway Line for the first-ever joint Olympic cheering. 7. The South and the North have agreed to actively promote humanitarian cooperation projects. The South and the North have agreed to expand reunion of separated family members and their relatives and promote exchanges of video messages. To this end, the South and the North have agreed to station resident representatives from each side at the reunion center at Mt. Geumgang when it is completed and regularize reunions of separated family members and their relatives. The South and the North have agreed to actively cooperate in case of emergencies, including natural disasters, according to the principles of fraternal love, humanitarianism and mutual assistance. 8. The South and the North have agreed to increase cooperation to promote the interests of the Korean people and the rights and interests of overseas Koreans on the international stage. The South and the North have agreed to hold inter-Korean prime ministers’ talks for the implementation of this Declaration and have agreed to hold the first round of meetings in November 2007 in Seoul. The South and the North have agreed that their highest authorities will meet frequently for the advancement of relations between the two sides.